A & D Roofing - Fascia/Soffits/Guttering, Roofer based in Gosport, Hampshire. A & D Roofing is family run business based in Gosport, Hampshire. We have over 17 years’ experience in the Roofing trade and pride ourselves on our reliability and quality workmanship. 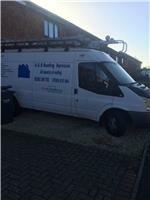 No job too big or too small so if you need your Gutter repaired, Moss removed or your roof repaired or re-tiled we would be happy to help. If you have an emergency repair or an enquiry please feel free to contact me. For more reviews and pictures of work we have done please see our Facebook page.